Seventy-one catalogues (24 cm), as issued, in publisher’s printed wrappers. - Complete run of catalogues 1-71, plus the two associated indices (catalogues 1-25, 26-50), four catalogues from the series of Lists, and one publication hors série. ¶ Fine copies ● Catalogues 69-71 and “Lists” are not shown in our photograph. (24 cm), 64 pp. Publisher’s printed wrappers. (24 cm), 64 pp. Publisher’s printed wrappers. - “A key to some 3200 different books, drawings, manuscripts, catalogues and periodicals described with appropriate notes and collations in the twenty-five catalogues of books on architecture and related subjects issued by Hugh Pagan Limited between June 1996 and September 2004”. Compiled by Rebecca Keary. (24 cm), 48 pp., illustrations. 155 items; priced. Publisher’s printed wrappers. (24 cm), 44 pp., illustrations. 147 items; priced. Publisher’s pictorial wrappers. - Includes books from the library the British Arts-and-Crafts architect Robert Weir Schultz (1860-1951). (24 cm), 48 pp., illustrations. 150 items; priced. Publisher’s pictorial wrappers. (24 cm), 56 pp., illustrations. 150 items; priced. Publisher’s pictorial wrappers. (24 cm), 56 pp., illustrations. 151 items; priced. Publisher’s pictorial wrappers. - Includes an album of engravings of Roman churches by Valérian Regnart and others, in a contemporary binding ornamented with insignia of Pope Alexander VII. (24 cm), 56 pp., illustrations. 153 items; priced. Publisher’s pictorial wrappers. (24 cm), 60 pp., illustrations. 147 items; priced. Publisher’s pictorial wrappers. - Includes a set of proof-sheets of Horace Walpole’s Description of the villa…at Strawberry Hill (1784), extensively annotated by Thomas Kirgate (from the library of Robert, 9th Baron Walpole, 1913-1989). (24 cm), 60 pp., illustrations. 145 items; priced. Publisher’s pictorial wrappers. (24 cm), 59 (1) pp., illustrations. 150 items; priced. Publisher’s pictorial wrappers. (24 cm), 64 pp., illustrations. 140 items; priced. Publisher’s pictorial wrappers. - Includes (item 140) an album of drawings by Girolamo Toma reproducing coats of arms designed by Roman architects of the 16th and 17th centuries, intended as a continuation of Filippo Juvarra’s published volume of engravings of armorial escutcheons (now in the Getty Research Institute, Acc no. 91-A32). (24 cm), 60 pp., illustrations. 147 items; priced. Publisher’s pictorial wrappers. (24 cm), 60 pp., illustrations. 144 items; priced. Publisher’s pictorial wrappers. (24 cm), 60 pp., illustrations. 147 items; priced. Publisher’s pictorial wrappers. - Includes (pp.59-60) a review of Eileen Harris & Nicholas Savage, British architectural books and writers, 1556-1785 (Cambridge 1990). (24 cm), 60 pp., illustrations. 144 items; priced. Publisher’s pictorial wrappers. 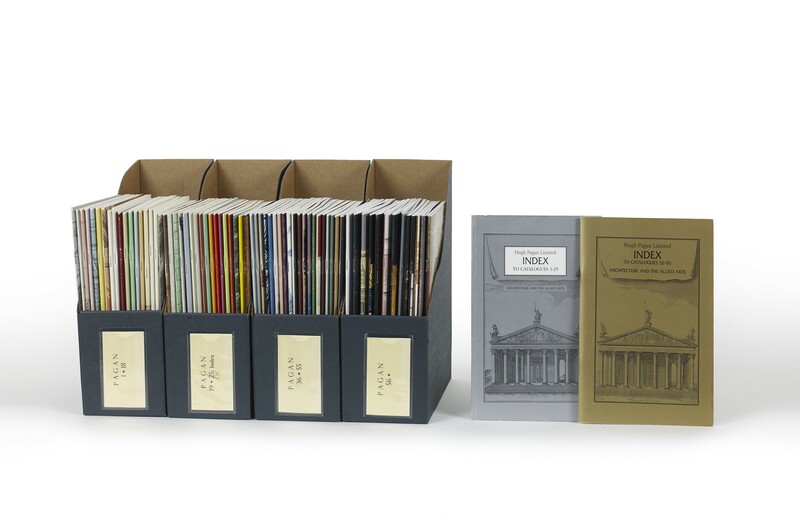 - Includes (item 115) two volumes of Stuart & Revett’s Antiquities of Athens in the presentation bindings designed by Stuart, with the third volume in a matching binding executed c. 1820 by the London binder Francis Wesley. Comparison is made with bindings on other copies. (24 cm), 56 pp., illustrations. 136 items; priced. Publisher’s pictorial wrappers. (24 cm), 60 pp., illustrations. 141 items; priced. Publisher’s pictorial wrappers. (24 cm), 64 pp., illustrations. 142 items; priced. Publisher’s pictorial wrappers. (24 cm), 60 pp., illustrations. 138 items; priced. Publisher’s pictorial wrappers. (24 cm), 60 pp., illustrations. 145 items; priced. Publisher’s pictorial wrappers. - “We include in this catalogue a number of titles from the recently dispersed library of Nathaniel Lloyd, author of substantial books in the inter-war period on the English house and on the history of English brickwork”. (24 cm), 56 pp., illustrations. 138 items; priced. Publisher’s pictorial wrappers. - Paste-on cancel on title-page. (24 cm), 58 (2) pp., illustrations. 135 items; priced. Publisher’s pictorial wrappers. - Includes books from the library of the Belgian architect Jules Brunfaut (1852-1942). (24 cm), 52 pp., illustrations. 139 items; priced. Publisher’s pictorial wrappers. 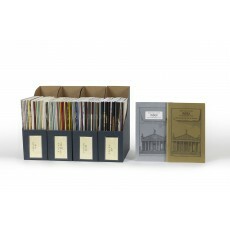 - “A number of the books listed are recent purchases from the library of the architectural historian Wolfgang Herrmann”. (24 cm), 56 pp., illustrations. 140 items; priced. Publisher’s pictorial wrappers. (24 cm), 56 pp., illustrations. 135 items; priced. Publisher’s pictorial wrappers. (24 cm), 60 pp., illustrations. 140 items; priced. Publisher’s pictorial wrappers. (24 cm), 56 pp., illustrations. 125 items; priced. Publisher’s pictorial wrappers. (24 cm), 52 pp., illustrations. 130 items; priced. Publisher’s pictorial wrappers. (24 cm), 52 pp., illustrations. 128 items; priced. Publisher’s pictorial wrappers. (24 cm), 56 pp., illustrations. 127 items; priced. Publisher’s pictorial wrappers. (24 cm), 52 pp., illustrations. 133 items; priced. Publisher’s pictorial wrappers. (24 cm), 60 pp., illustrations. 132 items; priced. Publisher’s pictorial wrappers. (24 cm), 60 pp., illustrations. 135 items; priced. Publisher’s pictorial wrappers. (24 cm), 68 pp., illustrations. 132 items; priced. Publisher’s pictorial wrappers. (24 cm), 64 pp., illustrations. 135 items; priced. Publisher’s pictorial wrappers. (24 cm), 64 pp., illustrations. 132 items; priced. Publisher’s pictorial wrappers. - Includes books from the library of Peter Murray (1920-1992), Professor of the History of Art at Birkbeck College, London (1967-1980), recently deaccessioned by the College. (24 cm), 56 pp., illustrations. 130 items; priced. Publisher’s pictorial wrappers. (24 cm), 56 pp., illustrations. 133 items; priced. Publisher’s pictorial wrappers. (24 cm), 56 pp., illustrations. 133 items; priced. Publisher’s pictorial wrappers. - Includes books from the library of the architect Roderick Gradidge (1929-2000), deaccessioned by the Art Workers’ Guild. (24 cm), 64 pp., illustrations. 131 items; priced. Publisher’s pictorial wrappers. (24 cm), 60 pp., illustrations. 131 items; priced. Publisher’s pictorial wrappers. (24 cm), 60 pp., illustrations. 127 items; priced. Publisher’s pictorial wrappers. - Includes books from the library of Martin Bowes (1670-1726), acquired by the vendor in a provincial auction saleroom (Ely, Cambridgeshire). (24 cm), 64 pp., illustrations. 139 items; priced. Publisher’s pictorial wrappers. (24 cm), 60 pp., illustrations. 137 items; priced. Publisher’s pictorial wrappers. (24 cm), 56 pp., illustrations. 126 items; priced. Publisher’s pictorial wrappers. (24 cm), 60 pp., illustrations. 124 items; priced. Publisher’s pictorial wrappers. (24 cm), 60 pp., illustrations. 131 items; priced. Publisher’s pictorial wrappers. - Noticed in The Book Collector, Autumn 2007, pp.414-415. (24 cm), 64 pp., illustrations. 129 items; priced. Publisher’s pictorial wrappers. (24 cm), 60 pp., illustrations. 129 items; priced. Publisher’s pictorial wrappers. - Includes books from the library of the architectural historian Jill Allibone (1932-1998), biographer of the Victorian architects Anthony Salvin and George Devey. (24 cm), 56 pp., illustrations. 131 items; priced. Publisher’s pictorial wrappers. - Books from the library of the English architectural historian Howard Colvin (1919-2007). “It should be recorded that although he did not have a bookplate and he only occasionally wrote his name in the books that he possessed, his ownership of the books is in many cases attested by the presence inside them of letters addressed to him, or by marginal or loosely inserted notes in his small, neat handwriting”. (24 cm), 56 pp., illustrations. 128 items; priced. Publisher’s pictorial wrappers. (24 cm), 52 pp., illustrations. 125 items; priced. Publisher’s pictorial wrappers. - “A number of the books listed have recently been purchased by us from John House, Walter H. Annenberg Professor in the History of Art at the Courtauld Institute, London”. (24 cm), 56 pp., illustrations. 124 items; priced. Publisher’s pictorial wrappers. - Includes books from the library of the British architect James Stirling (1924-1992). (24 cm), 60 pp., illustrations. 128 items; priced. Publisher’s pictorial wrappers. (24 cm), 64 pp., illustrations. 1280 items; priced. Publisher’s pictorial wrappers. (24 cm), 60 pp., illustrations. 129 items; priced. Publisher’s pictorial wrappers. (24 cm), (2) 65 (1) pp., illustrations (2 in colour). 126 items; priced. Publisher’s pictorial self-wrappers. (24 cm), (2) 65 (1) pp., illustrations (some in colour). 122 items; priced. Publisher’s pictorial self-wrappers. (24 cm), (2) 61 (1) pp., illustrations (some in colour). 123 items; priced. Publisher's pictorial self-wrappers. Five volumes (24 cm, or A4), as issued. ¶ Lateral folds.